Keep these tools stocked in your tool shed in case of car repairs. If your car is having issues, you may be tempted to repair the car yourself. 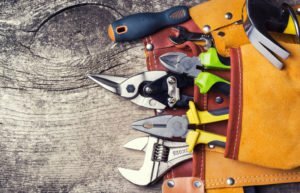 Whether you’re a budding mechanic or looking for ways to save, you’ll find that you’ll need some tools to complete some work. You may already have some tools in your garage that will help you along on repairing and mending your vehicle. Torch: You’re going to need to see under the hood if you want a proper inspection and analysis. Tire pressure gauge: Every car owner needs to own a tire pressure gauge. Even if you plan on never popping the hood, a tire gauge is still a must, as no one ever wants over or under-inflated tires. Wrench set: Carry around a set of wrenches in different sizes. While a 10mm wrench is the most popular size for Japanese cars, you may need different sizes of wrenches. Screwdrivers: A Phillips and a flat-head screwdriver are worth the investment! Trust us! Jack and jack stands: With a good jack and set of jack stands, you can do almost anything your local mechanic can do with their lift. If you are going to be working on your car, you’ll need to easily access the underneath of it. Jumper cables: A dead battery is never ideal. Jumper cables are able to start the car, even if the battery itself cannot hold a charge any longer. Is your toolbox stocked with these essentials? With these tools and the right auto insurance in Fresno, California, your car will be kept safe on and off the roads! Get started on securing the right policy for your needs and vehicle by contacting the professionals at McCarty Insurance Agency!